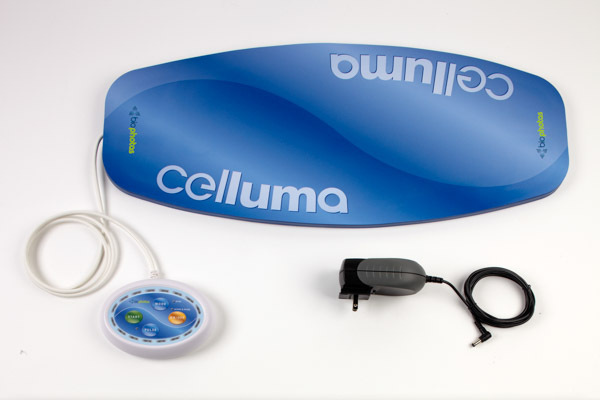 Celluma is a powerful stand alone LED panel that is extremely useful in the esthetic treatment room. In order for LED to have any effect on a living biological system, LED-emitted photons must be absorbed by a chromophore or photoacceptor. Light, at appropriate doses and wavelengths, is absorbed by chromophores such as porphyrins, flavins and other light-absorbing entities within the mitochondria and cell membranes of cells. This absorption increases the production of adenosine triphosphate (ATP), the fuel that drives all of the biochemical processes in the cell. This boost of cellular energy results in a cascade of metabolic events that lead to an increase of microcirculation, tissue repair, and a decrease in inflammation and pain. The effect on the tissues depends on which wavelength of light you choose to use on your client. One thing to note, Celluma is the only panel device on the market that is FDA-cleared to treat with blue, red and infrared simultaneously. The Acne setting emits blue light at a wavelength of 465 nanometers (nm). Choosing this setting will emit the greatest amount of blue light, some red and a smaller amount of infrared. 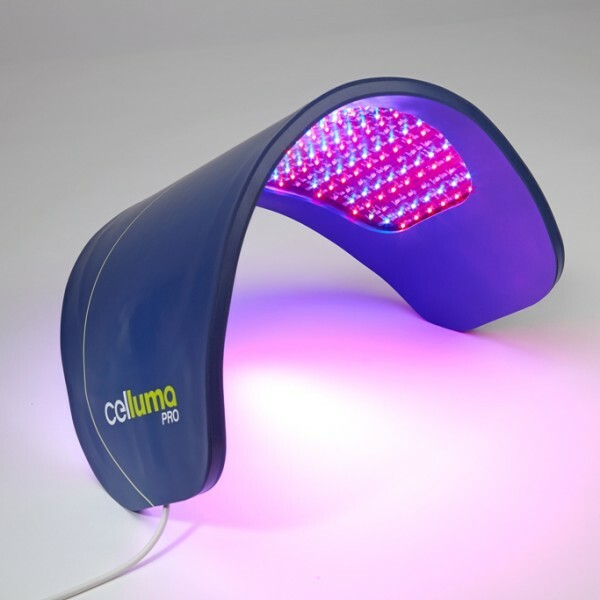 Blue LED penetrates only a few mm into the epidermis and is beneficial in treating acne. It creates a ‘death cycle’ of the P. acnes bacterium. The Anti-Aging setting emits red light at a wavelength of 640 nm. Choosing this setting emits the most equal amounts of blue, red and infrared LED. Red LED penetrates a bit deeper than blue, about 8 – 10 mm, and stimulates fibroblasts, stimulating the production of collagen and elastin, therefore treating fine lines & wrinkles. When you are in doubt about which setting to use, this is the best bet, as it will treat all layers of the epidermis / dermis equally. The Aches & Pains setting emits infrared light at a wavelength of 880 nm. Choosing this setting emits the greatest amount of infrared, a smaller amount of red and an even smaller amount of blue LED. This wavelength penetrates deeper than red, about 30 – 40 mm and is beneficial in treating arthritis, muscle spasm, muscle & joint pain, muscle tissue tension, joint & muscle stiffness, diminished local circulation and post-surgical healing. The Celluma console also has the choice of pulsing (which is the default) or not pulsing. The reason for the default pulse setting, is there is research that demonstrates that pulsed light enhances collagen production. The ‘pulse train interval’ or the time between pulses was determined to be a better predictor of collagen production than the ‘pulses per pulse train’. More clearly stated for the lay-person, the interval between pulses is a better predictor of pulsing efficacy than the number of pulses per interval. (If you feel like diving into the science of this particular study from Barolet, et al, here is the link! I will warn you – your brain will hurt after reading through this study!) I will summarize the results below. The results of the study that Barolet & his colleagues performed demonstrated that when the PD (pulse duration) was reduced from 500 to 100 microseconds, the cellular collagen production was largely enhanced, producing 152% more collagen than the control subject, which was not exposed to pulsing light. The study also revealed that the best PTI (pulse train interval, or time between pulse trains) was 750 microseconds, producing 279% more collagen than the control (no pulse). In addition, collagen levels were shown to be negatively correlated with the duty cycle. A duty cycle is the fraction of one period in which a signal or system is active. Thus, a 60% duty cycle means the signal is on 60% of the time but off 40% of the time. The “on time” for a 60% duty cycle could be a fraction of a second, a day, or even a week, depending on the length of the period. In the case of the study done by Barolet, et al, the duty cycle was measured in microseconds, and they found that the higher the duty cycle, the lower the collagen production. In essence, the longer the light was on, the less collagen was produced. The general findings of this study seem to imply that that cells require time / pauses to absorb and handle photons and that over- or under-stimulation of these cells may hinder specific cell signaling pathways. Too long a pulse may produce cellular exhaustion, whereas too short a pulse may deliver insufficient energy for a biologic effect to occur. Thus, the Celluma utilizes specific pulse patterns that are designed to optimize the cellular response which enhances outcomes, therefore producing an outstanding physical result. So, the short answer to the question of when to pulse and when not to pulse, is always choose pulse EXCEPT if your client really can’t stand it! They will still get results, but they will be slower than if you are able to use the pulse setting!!! !